At cocktail bars all around town, bartenders are having fun with throwback, down-market drinks. Hey, bartender, the ’70s called. They want their cocktails back. I joked about that with the bartender at Canon recently, as he served me a sparkling Long Island Iced Tea. Turns out they weren’t the only one bringing back embarrassingly bad drinks from the big-hair ’80s and platform-shoe era. 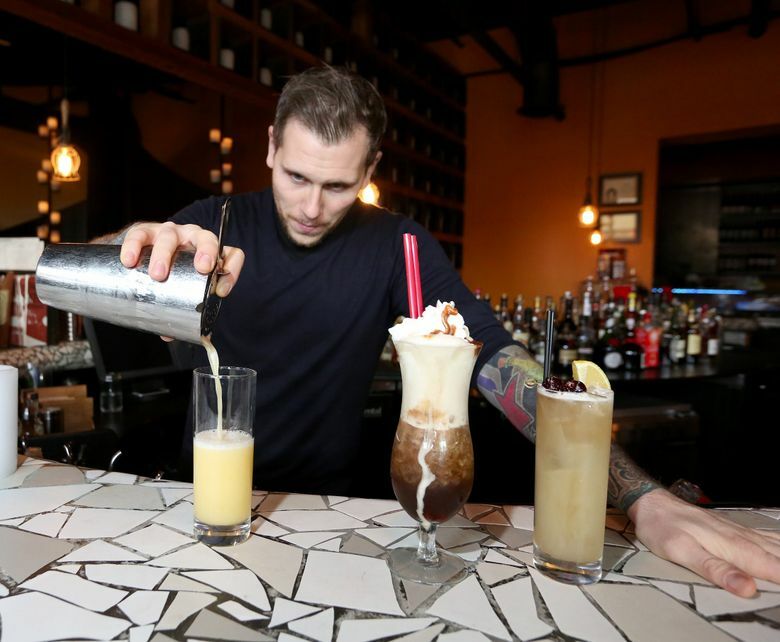 Some of the best bars in Seattle now feature riffs on the Harvey Wallbanger or the Kamikaze. Other mixologists are digging deeper into grandpa’s drink repertoire to bring back the Grasshopper and old-school drinks that millennials wouldn’t be caught dead with on Instagram. Some are meant to be ironic or kitschy. Others are reinterpretation of downmarket drinks to give them a second act. You can thank, or blame, Portland bartender Jeffrey Morgenthaler for making these bad drinks cool again. At his basement bar Pepe Le Moko, he has tweaked and elevated many drinks from the cocktail’s dark ages. But the Seahawks, yes, the Seahawks, are another reason these drinks are featured now around Seattle. If you sat at a bar during the last three seasons, you saw those electric-blue drink specials. Those Seahawks-team-colored cocktails get their hues from blue curaçao, a liqueur used in those cloyingly sweet fishbowl drinks from decades past. These drinks all taste the same around town since they’re basically a rip off of the Blue Hawaiian, though some bartenders will mercifully squeeze in a half lemon to dial back on the sweetness. As if on cue, my head-bopping bartender served me a Long Island Iced Tea Fizz as Shaun Cassidy’s “Da Doo Ron Ron” came on the speaker. The drink is mixed with an egg white for a thick, foamy texture, almost like a dessert drink. This Linda Derschang joint is considered a maritime-themed dive, but it’s really a tiki bar at heart. 606 Broadway E., (206-420-8742 or baitshopseattle.com). If the ’70s and ’80s were good to you, then this mescal bar is where you want to relive it. Talented bar man Casey Robison decided enough with all this stuffy talk in the craft-cocktail community. He started “Throw Back Thursday” to feature the Harvey Wallbanger, Mudslide and other dubious drinks. Though his staff makes them more drinkable by subbing in fresh-squeeze juice and better booze to make them more balanced and less sweet. 1420 12th Ave., (206-588-8105 or barriorestaurant.com). This cocktail temple makes some of the most sophisticated drinks around, but it also has a playful side. One best seller is its bottled Long Island Iced Tea, pumped with CO2 to give it a soda-like texture. It’s not on the fall menu, but expect it back at some point, since it’s such a crowd-pleaser. 928 12th Ave. (206-552-9755 or canonseattle.com). The new bar, opened this week in the Central District, serves retro cocktails such as the Stinger and Rusty Nail and soon the Grasshopper and brandy Alexander. But its most interesting drink is its classy take on the Appletini, mixed with fresh-pressed Granny Smith apple juice and a tinge of beer hops. 1305 E. Jefferson St. (206-328-7090 or sevenbeef.com).